Zea Mays Printmaking is housed in a 6,000 square foot studio in the Baystate section of Florence in an old mill built in the late 19th century that once made Cutlery. We are located at 320 Riverside Drive in Florence, Massachusetts (just outside of Northampton). Our studio is comprised of several spaces. 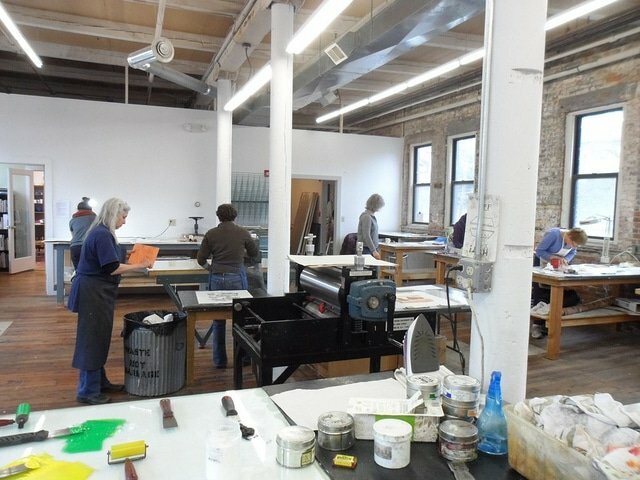 On the main floor we have the Sanford Gallery, our teaching studio with a 34″ x 60″ Takach etching press, 24″ x 48″ Charles Brand Etching Press, and 24″ x 42″ Praga Etching Press as well as our Etching facilities, Screen printing facilities, computers and Photopolymer facilities. The main floor also houses The Annex, our private studio for residency artists and editioning projects. Our Flat File Project and a critique area are also located on the ground floor. Upstairs is our Members’ Studio with 2- 24″ x 48″ Takach Etching Presses, a 24″ x 42″ Rembrandt Pelican Etching Press and 18″ x 24″ Showcard Relief Press, 1 Kelsey 8″ x 10″ clamshell press and 1 Kelsey 3″ x 5″ clamshell press and various cases of type, seven works stations, hot plate, library and kitchen.